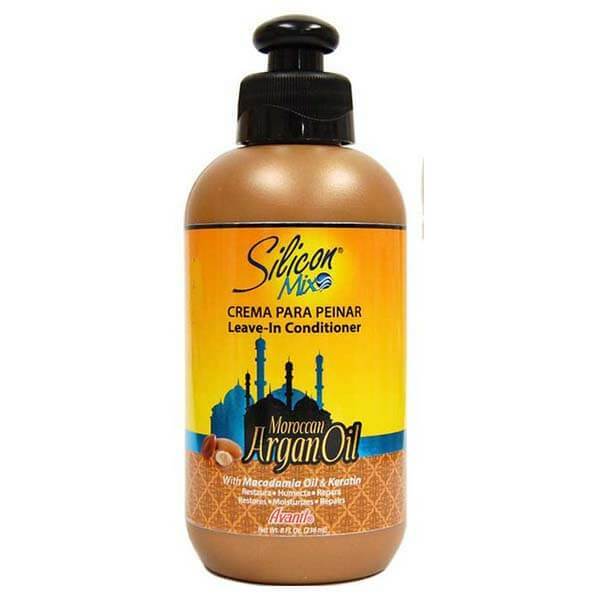 Silicon Mix Argan Oil Leave-in 8 oz conditioner with Moroccan Argan oil is specially developed for dry, damaged and brittle hair. Protects, hydrates, softens and repairs hair. Contains 100% pure Argan Oil (rich in Omega 6, Omega 9 and vitamin E), Macadamia Oil and Keratin. Penetrates to the hair shaft to stimulate hair growth. Protects against hair breakage and gives shine and softness to the hair. Provides protection against sun, wind, salt water, chlorinated water and chemical processes. Use as a heat protector before blow drying your hair or curl iron and straightener. Can be used daily. Apply evenly on damp or dry hair. Do not rinse! Style your hair as desired.